Here is a quick video of a fishing HOW TO I threw together on how to pull a dredge from a small boat. 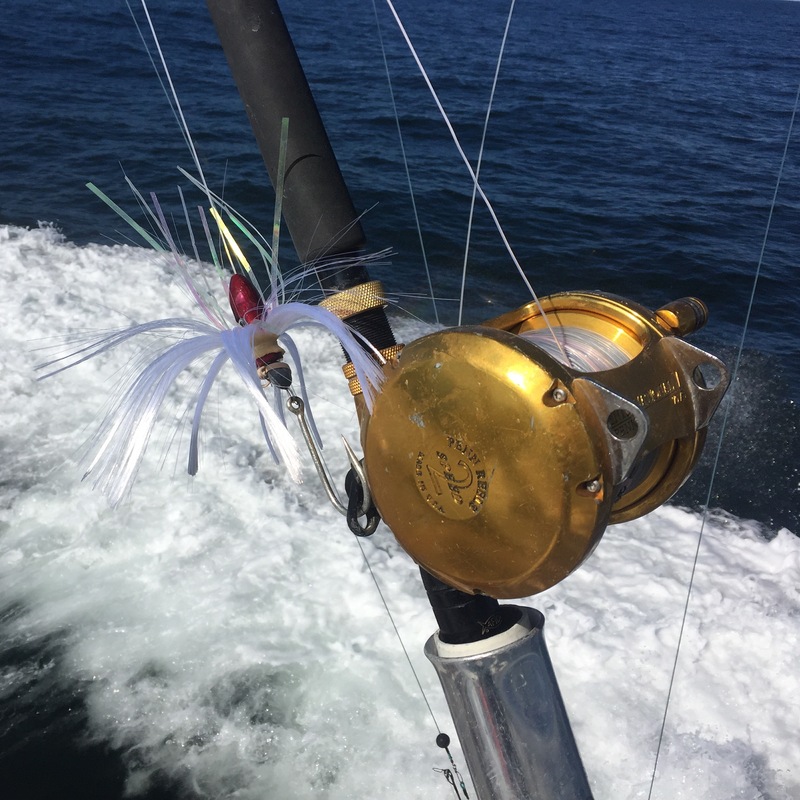 We packed up the 52′ Ocean Yacht Saltitude with plenty of butterfish chunks, sardines, squid, ballyhoo, and all the tackle imaginable to be ready to catch anything the ocean offered us. We pulled out of the slip at the Canyon Club and started running for the Lindenkohl Canyon. We arrived around 11 and started off pot hopping for mahi with very little success since it looked like the lobster boat had just come through and cleaned up his gear. 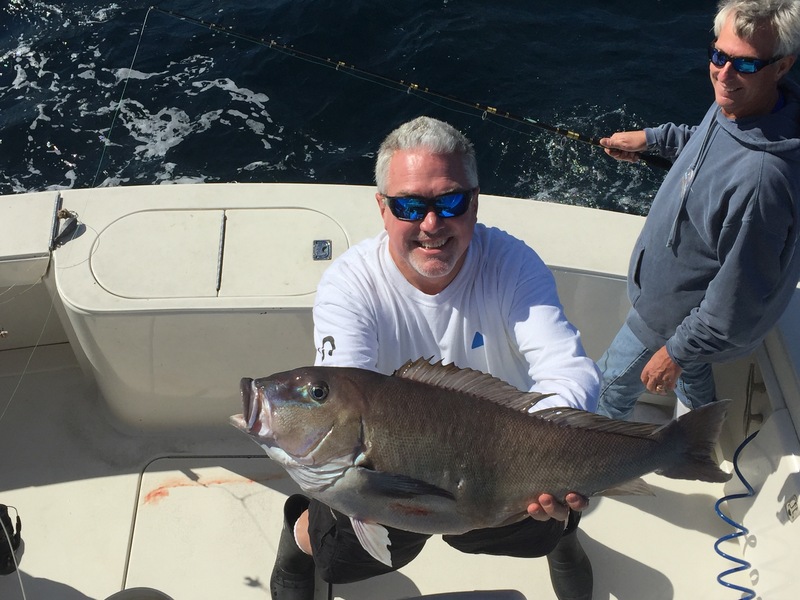 We deep dropped for about an hour and caught some nice bullion tilefish before getting up on the troll. We trolled around the Lindy for a bit but the water was very green and showed no signs of life. We trolled downs to the Carteret Canyon hoping to stumble upon something better along the way. Once we got into the Carteret we still had the same 70 degree green water, but there was a lot more bait. We picked at a few mahi trolling around the lobster pots and were bit off by a double header of wahoo. Bummer. We setup in the NE corner of the canyon for the night and started chunking at 7pm. We managed to catch 2/4 40# yellowfin tuna in the first two hours. We had a little lull and then around midnight we picked up another 25 pound yellowfin on a chunk bait and caught a swordfish and released a tiger shark. We had squid in and out of our lights all night along with the occasional shark and even an ocean sunfish. We also had 2 more legitimate shots at swordfish that didn’t pan out and another 2 mystery bites on the sword rod. 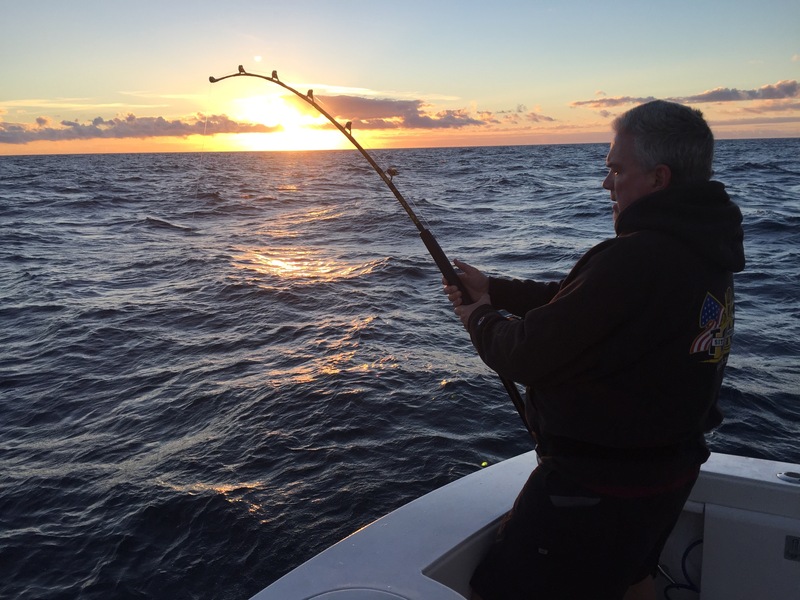 Around first light at 6am, we picked up a nice longfin tuna that was easily 50 plus. Not too long after we got an awesome swordfish bite that pulled off on the run. 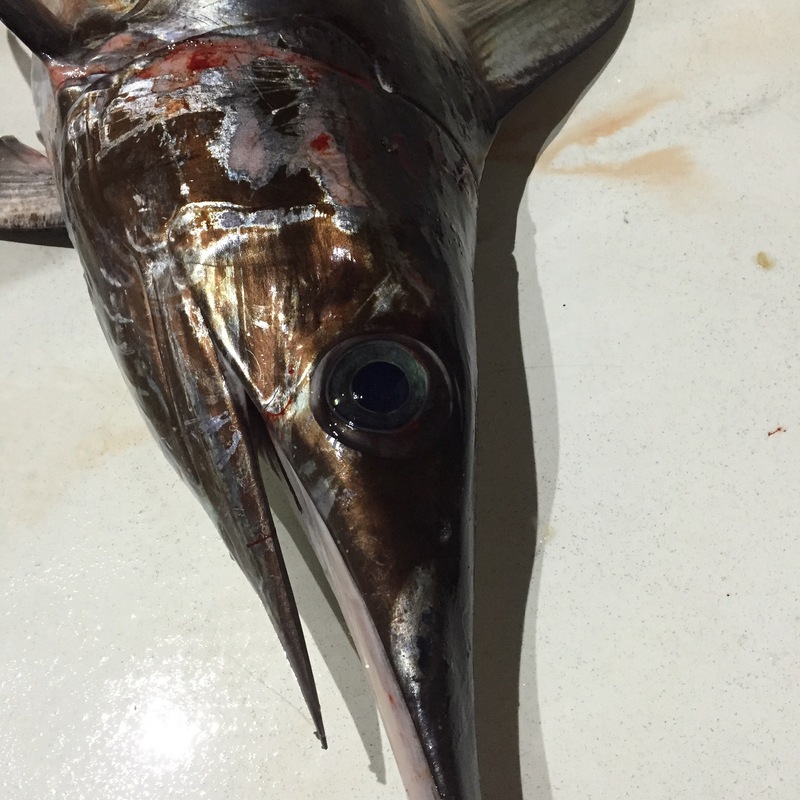 bad luck on the swordfish, but at least we had one in the box. At 7am we got hooked into a nicer tuna that went running all around the boat. We decided to go cause after this one and we got a great look at the fish for the final 10 minutes of the fight and saw it was a nice Alison tuna pushing 100 lbs. It stayed just outside of gaff range and then the 40# fluorocarbon leader finally parted. What a heartbreaker and rough way to end the trip. Good timed regardless with plenty of action. We made out way back out to the Lindenkohl Canyon on the 55′ Gwaltney Low Profile on another overnight trip. The ride out was beautiful and unfortunately we got a late start which only gave us an hour of trolling time in the blue green 70 canyon water. Not much to it other then a couple of mahi. We setup on the chunk around 6:45 and at 7pm it was game on with a nice swordfish. We fought the sword until 11:45 when unfortunately the hook pulled. Major bummer. At this point it was getting pretty rough and difficult to fish. We did manage to get into another swordfish but some more bad luck hindered us and the line parted. Due to the sea conditions we packed it in at 7am and made our way home. Very long ride home and a tough trip..
With calm seas and beautiful sunny skies we took off for the Lindenkohl Canyon on the 55′ Gwaltney Low Profile. We got on the troll just after 5pm and trolled until dark. 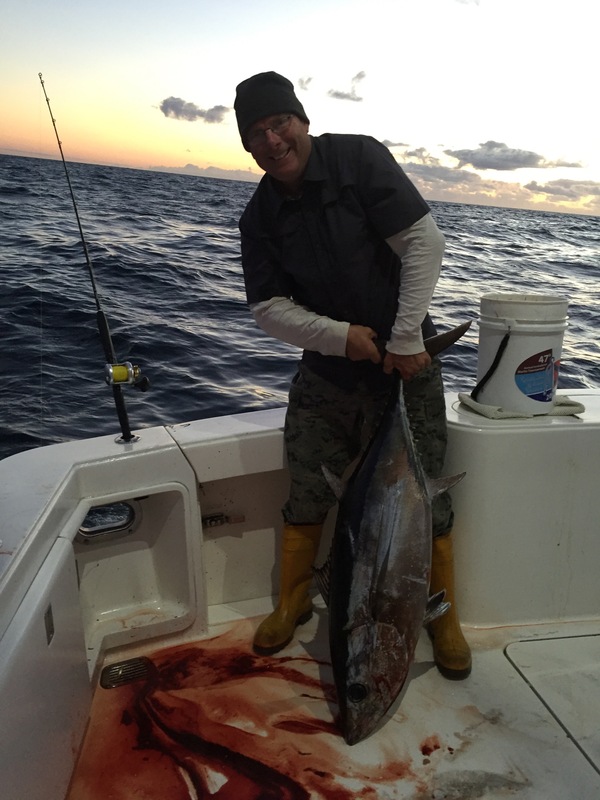 We managed to get a double header of 30-40 pound yellowfin tuna. We got setup just at dark and started chunking for tuna. We hooked into 3 tunas 80′ down on a squid earlier in the night and boated 2 of the same class yellowfins that we caught on the troll. We also managed to hook into 3/4 of our swordfish bites but unfortunately had bad luck pulling hooks on two and only released a pup. The early morning dark hours only amounted to numerous tiger sharks and a blue shark release. They were wreaking havoc on our surface shark bait and even our sword baits. We probably went on to release at least 8 sharks and of course had a few finally chew through the mono leader on the sword rods. Plenty of action. 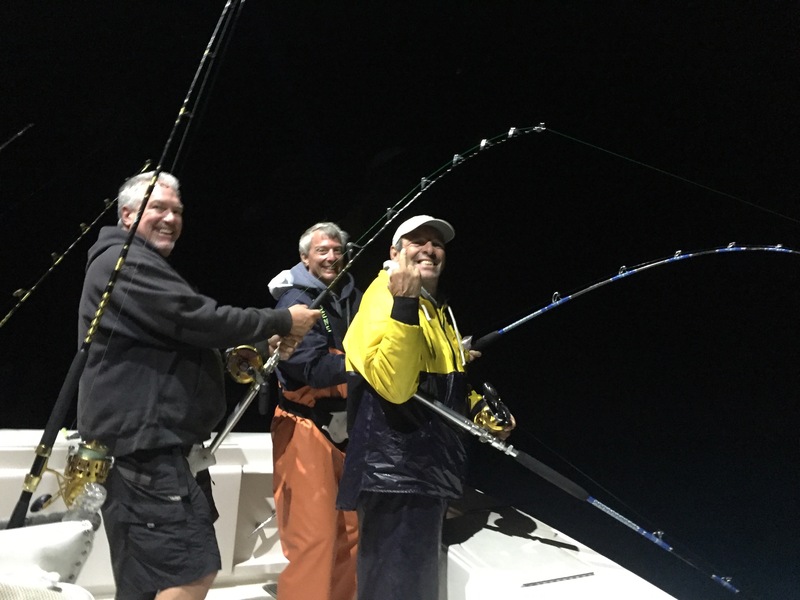 We also caught a couple Mahi in the dark chunking and spent a little time catching some grey tilefish before we headed for home. All in all, fun trip with plenty of action and perfect weather! We finally, after a 17 day blowout, got a chance to get a fishing trip in. The NE wind has been out of control, but with this weather window we packed up the 48′ Ocean Justified and headed out for the Wilmington Canyon at 6 am. The seas were calm and the sun was shining. We got on the troll around 9:30am in the clean green 71.3 degree water and ended up getting a mako hooked up but after an awesome jump he bit through the leader. The pilot whales were in the canyon, but they were scattered and more towards the west wall. We did have a few mystery bites that’s didn’t stay tight, but we decided around 2pm to pack it up and take of for the Lindenkohl Canyon. We didn’t see much on the long run north but did find acres or porpoise and a few finbacks working the Lindenkohl. The water was blue green and 73 degrees here. It looked promising but no luck. We saw a tailing sword right at dark and we tied to entice it with our sword bait but no luck there either. We got on the drift and started chunking for the night. Overall we had scattered action on blue sharks catching and releasing about a dozen in the 150-300 pound range and ended up having a mako get wrapped up and break off along with releasing a small mako. We did manage to catch a small sword as well. In the morning the wind came up. We pot hopped and out about two dozen mahi in the box and also did a little bit of deep dropping for grey tiles catching about 10 or so before we headed for home. The West winds came on strong and we got our butts kicked in the 5-6′ at 5 second chop for awhile but made it home safe. Well, I have been blown out for 12 days now and it is looking like there is still at least 5 more blow out days to go. So I threw together this How To Video on how to make a Wire Ballyhoo Pin Rig for Trolling for Wahoo. Hope it helps some of you.